"Large marble-sized, golden orange fruit encased in beautiful paper lanterns. Tropical, pineapple/fruity tasting berries. Compact variety of this normally very large bush. 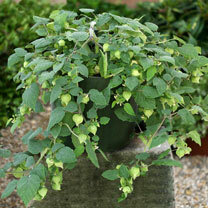 Perfect size for patio pots, hanging baskets or greenhouse. Autumn ripening fruit". Harvest September-October. Height 20-30cm (8-12"). Make sure that your Goldenberries are kept evenly moist and feed them with a high potash food once the first flowers have opened. Apart from watering, feeding and picking, no other care is needed. Ideal for beds, borders, pots and containers. Attractive to bees. Prefers full sun. 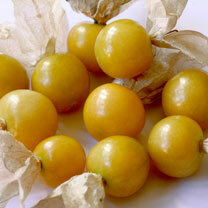 Goldenberries can be kept for several weeks if left in their 'lanterns' in a bowl on the kitchen worktop.